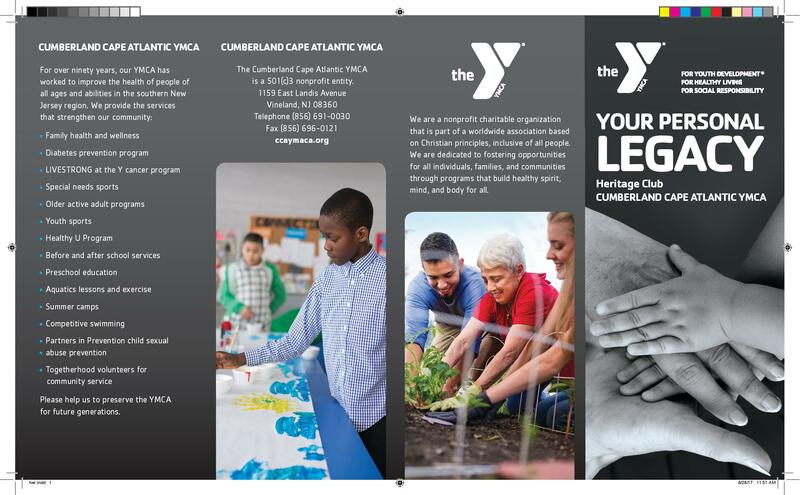 The YMCA celebrates our Heritage Club members, a very special group of people who have chosen to have a lasting impact on the Cumberland Cape Atlantic YMCA by generously making or planning future gifts to the YMCA's Endowment Foundation. Individuals and couples who make a gift to the Endowment Fund ensure the future of the Cumberland Cape Atlantic YMCA/YMCA of Vineland through valuable life-changing programs and services. These will continue to serve future generations, thanks to the Heritage Club donors vision and commitment to the Y. These gifts build long-term financial stability for our Y. With your commitment to the Heritage Club we create a promising tomorrow for kids, families and our community: so the good you do lives on forever. Stop by our lobby to see our recognition plaque to all those who have donated to the Endowment Fund. A Gift of Cash - In this way each member not only benefits from the good that will be done but current income tax savings. A Gift Through Your Will - You may wish to consider including the YMCA in your will or living trust. In this way, a fixed amount, specific asset or percentage of your estate may be set aside as bequests and qualify for estate tax deductions. For more information about various ways to support our endowment, please call George Steinbronn Jr., Executive Director, at 691-0030, extension 105.